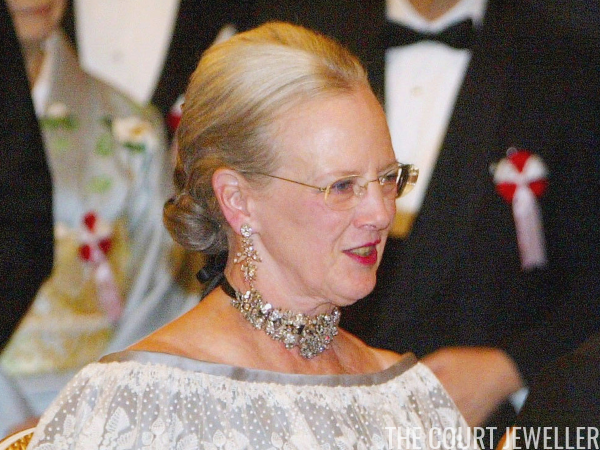 Queen Margrethe II of Denmark, our Magpie of the Month, is famous for her innovative jewelry wearing. Today's piece, the diamond floral bracelet that belonged to Queen Louise of Sweden, is one of her favorites to experiment with. 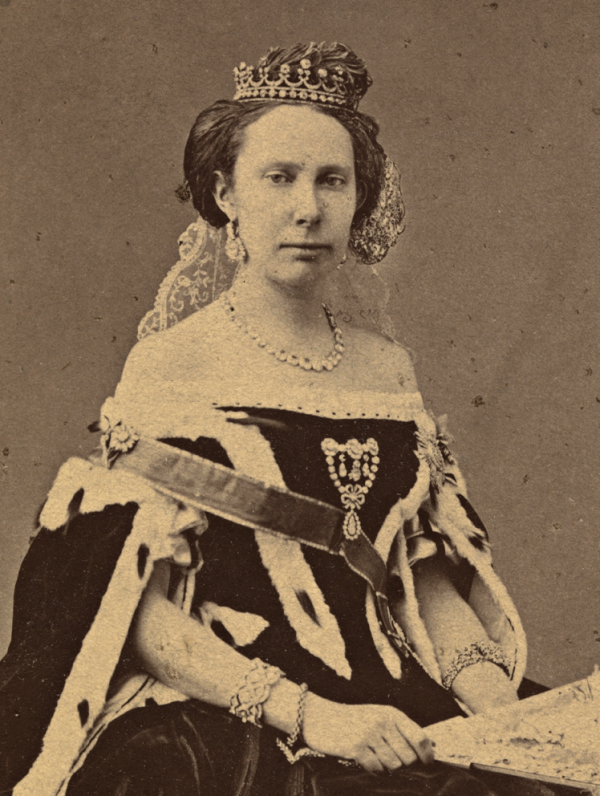 In 1850, King Oscar I of Sweden and Norway presented the bracelet to his new daughter-in-law, Princess Louise of the Netherlands, on her marriage to his eldest son and heir, Crown Prince Carl. In the portrait above, Louise wears the bracelet on her left arm. The bracelet was eventually inherited by Carl and Louise's daughter, Lovisa, who later became Queen of Denmark. Lovisa is apparently the one who designated the bracelet as a part of the Danish royal family's legacy jewelry collection. 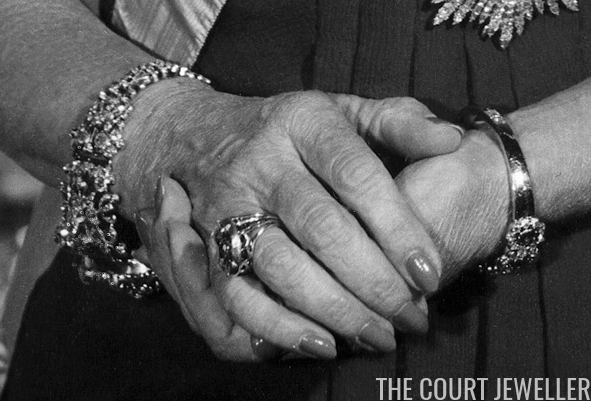 The bracelet was a great favorite with Queen Ingrid, who wore it often with a variety of jeweled parures. 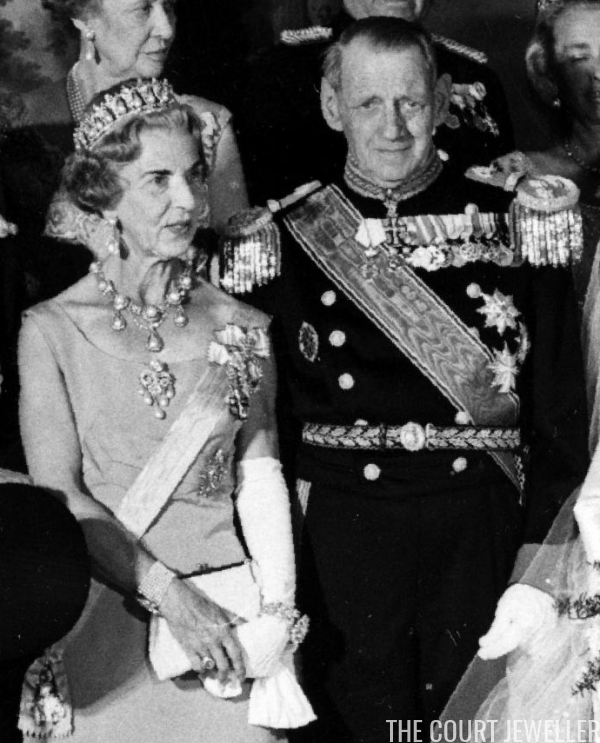 Here, at the wedding of King Harald and Queen Sonja of Norway in August 1968, she wears the bracelet on her left wrist, pairing it with the family's married pearl and diamond parure. This particular appearance gives an excellent perspective on the size of the bracelet. 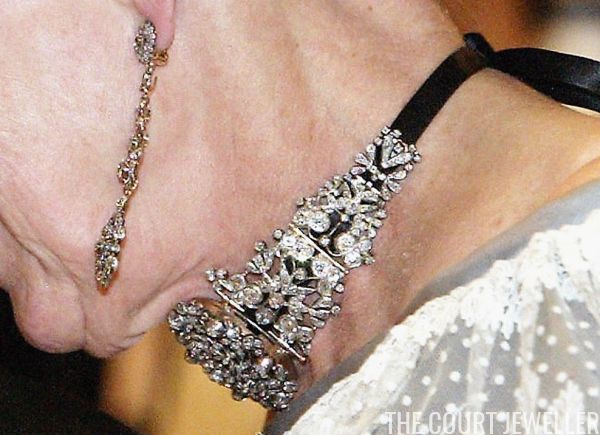 Margrethe has chosen to wear the converted bracelet-choker for portraits, including a striking image where she paired the jewel with the Pearl Poire Tiara, and for major royal events. In this image, the complicated diamond design of the piece becomes clearer. Above, she wears the bracelet as a choker necklace for the pre-wedding gala for King Felipe and Queen Letizia of Spain in May 2004. 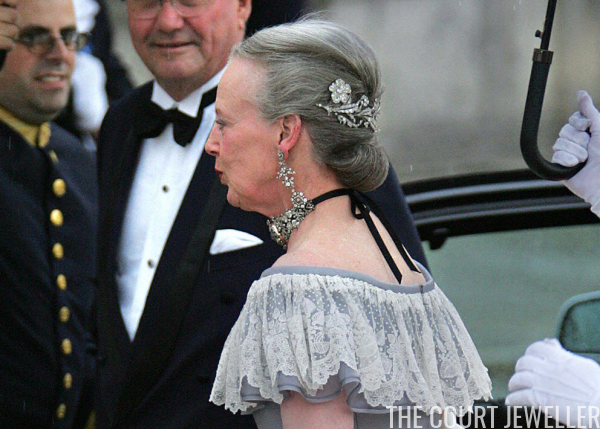 The gala was a black-tie event, so tiaras were not worn, but note that Margrethe snuck one in by wearing part of the Danish Floral Aigrette as a hair ornament. The bracelet/necklace (and the dress paired with it) was a favorite piece in 2004. 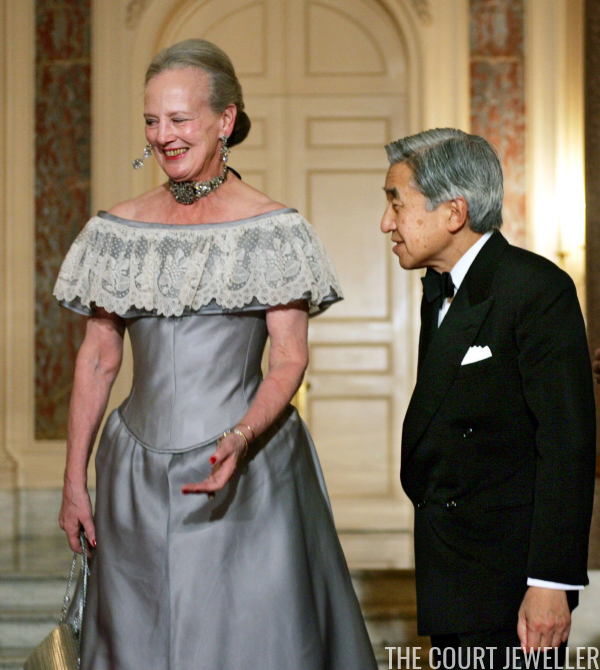 Margrethe also wore it that November at the Akasaka State Guesthouse during a state visit to Tokyo. 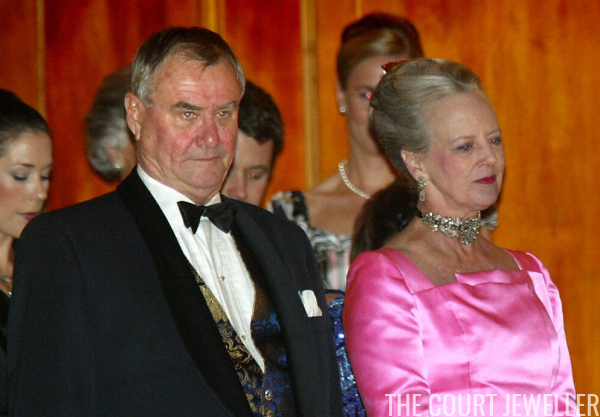 Margrethe also wore the necklace version of the bracelet a year earlier, during the October 2003 state visit from Grand Duke Henri and Grand Duchess Maria Teresa of Luxembourg to Copenhagen. On that occasion, she paired the jewels with a striking pink gown. 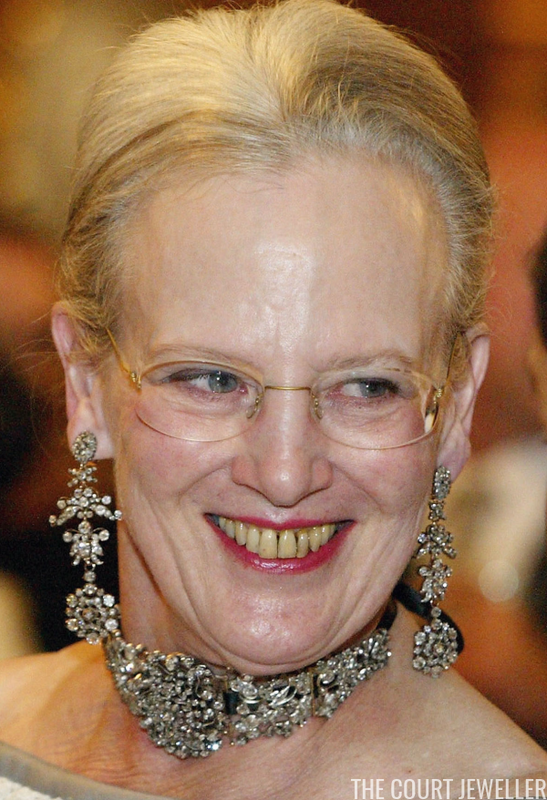 In 2000, Margrethe innovated again with the piece, adding even more diamonds to the converted choker necklace for a banquet at the Natural History Museum in London.